Andrew always thought that Fiona was out of his reach, but that did not stop him from pursuing her. Her quirks were something other people found weird but were endearing to him, and they made their relationship work despite the negativity of the people around them. But an accident takes Andrew to prison and Fiona can’t do anything to stop it. The two still promise to love each other and continue their relationship despite their current predicament. Prison is so hard, especially for a young guy like Andrew, but the thought of Fiona waiting for him outside helps him survive everything. When a chance to escape comes, Andrew grabs it, but it seems the world is so against them because as soon as they’re together, problems kept piling up. 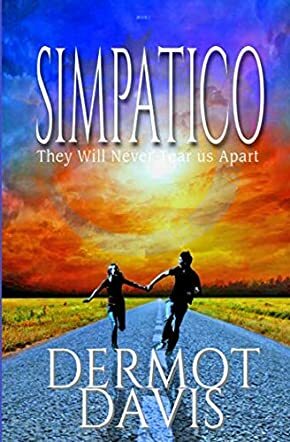 Will the two star-crossed lovers ever find their happy ending in Simpatico: They Will Never Tear Us Apart by Dermot Davis? The story of Simpatico: They Will Never Tear Us Apart by Dermot Davis is perhaps one of the most struggling love stories out there. As soon as they get a reprieve, another obstacle pops up. It seemed like their story was destined to be a lifelong battle, but Dermot Davis is a great story teller and was able to steer the plot in a wonderful direction. Andrew and Fiona were both lovable and strong characters. Their strength and resilience was something to be admired and their love was something to seek after. I loved how it ended and I am excited over how the story will pan out in the next installments. This book is a very good start to the series.